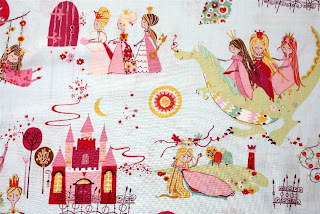 Quilt Taffy: Princess Giveaway Day! Our giveaway today is a set of fat quarters. Happy Spring Break next week! We'll have giveaway day again in 2 weeks. 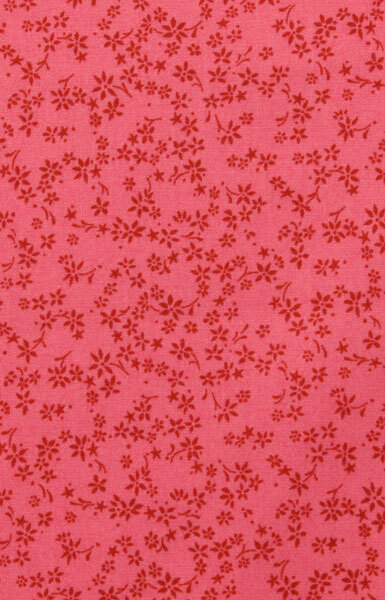 My little princess would love something made with this pretty fabric. Thanks! I have two Grand daughters who would love their Grandma to make something out of that fabric if I were to win. Thanks. I am the ultimate sewing princess! I LOVE this fabric! 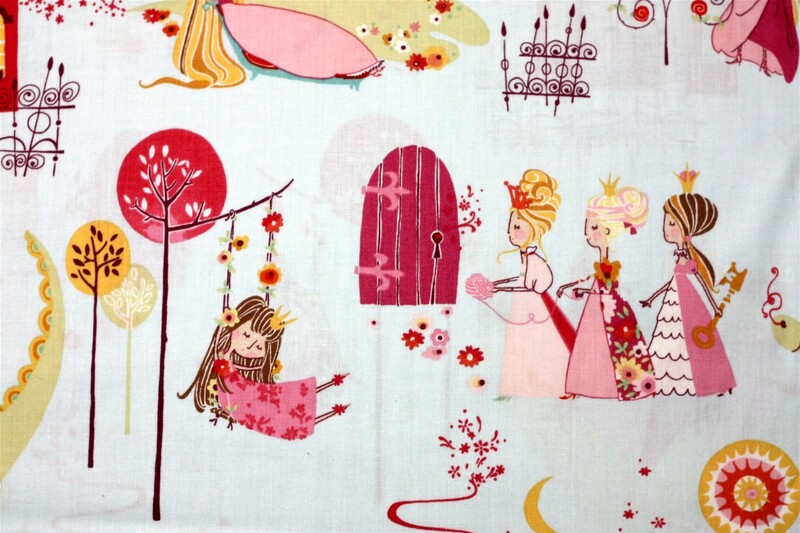 Beautiful princess fabric. Would make adorable drapes, a quilt and some pillows that any princess would love. Awww - this is magical fabric! It would make a lovely quilt for the hospital we are sewing for as a guild. Woinderful!! My little nine-years-old princess would be happy with these cute fabrics! We are all princesses at heart! :) Great fabric. Princess Kaitlyn aged 8 months would look so cute in or on those. 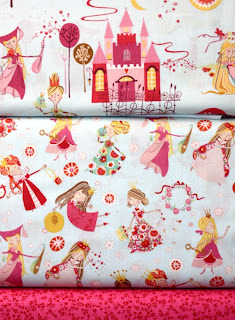 I would love some lovely princess fabric to use as lining for some lvely project, as i am a princess inside! A princess comment.............Here in Denmark we have the most beautiful princess - Princess Mary. My daughter , the ultimate princess ,would love these! she loves pink and purple colors, she would say "this fabric is perfect for me"
My favourite fairy stories were always the Princess ones. This fabric brings happy childhood memories to mind. Every girl pretends to be a princess no matter her age. My little princess is turning 3 next month. She would love this. How many fairytale stores can I tell at bedtime wiith a quilt made in this once upon a time fabbric for my little one. Fav colour combo yellows and pinks. Little Missy, my granddaughter, loves princesses. 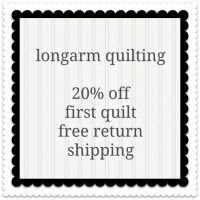 A cute little quilt would be on my to do list if I could win this fabric. Not a fan of pink but my daughter is. However, my favourite princess is Elizabeth from the Paper Bag Princess. Any girl who says to a prince: “Ronald, your clothes are really pretty and your hair is all neat. You look like a real prince, but you are a bum” deserves to be crowned Queen of all princesses!!! I actually have two princesses. Lauren who is eleven who plays the piano and Sara who is six and plays the violin. I couldn't ask for any better princesses than my two grand daughters. I even have two little prince's James and Owen who are five. I loved when my daughter used to make my husband play the Pretty Pretty Princess game with him! She is still his princess! thank you! A princess comment? Hmm. We love The Princess Bride around here so I will quote Princess Buttercup. "Westley and I are joined by the bonds of love. And you cannot track that, not with a thousand bloodhounds, and you cannot break it, not with a thousand swords." Ha! 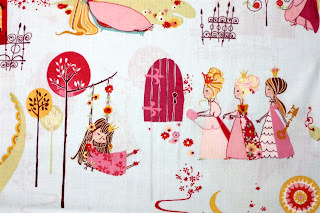 I have two granddaughters who would love the princess fabric. Thanks for the chance. My two Great Nieces are the princesses in my life. One is two and the other is 5. They are already practicing royalty. Adorable. These would be great additions to some "girly" quilt blocks I'm making. I'm sure I could find a little princess to make something for...I love making quilts for baby girls. Thanks for the chance to win! My daughter would love this fabric! She has been dressing up and pretending to be Rapunzel all week. Thanks for the giveaway! Good luck to all the princesses. my goddaughter loves to dress up as a princess. She always makes me be the wicked witch when we play. She dresses up in one of her princess outfits and I usually just put a tea-towel on my head! Such adorable fabric. Enjoy your spring break, Princess Corrie! love them. I am a Princess, I have lived in a house with 4 boys and a husband. I sleep in a Princess, it is a Queen bed minus the King. My teaching blog is called "The First Grade Princess". So, clearly, you can see that I am a Princess and deserve this beautiful material. My niece is the princess in this family. All of her cousins on this side of the family are all boys. She would love to have something made from these fabrics. 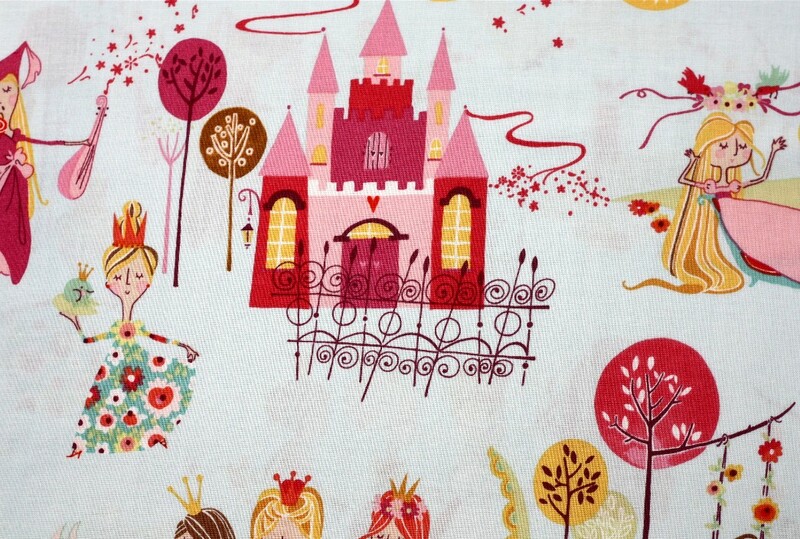 A little girl would surely find her Prince Charming with a quilt made with these fabrics. How sweet. Sew pretty! I would love to win some fabric to make something sweet for my grand daughters. My cousin's daughter is currently obsessed with princesses and dragons...thanks for the chance! Fingers Crossed...these fabrics are just too cute!! This princess is on spring break this week and not feeling very princess-like! So much studying to do...so little time! 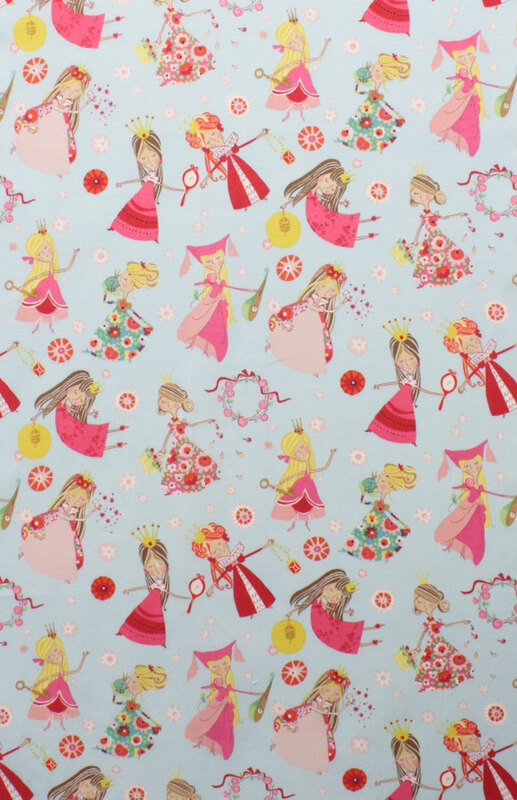 Darling princess fabrics! My little princess Grace would love something princess-y made out of them - probably a bag since she is a bag lady just like me! What a gorgeous line of fabric! Thanks for the chance on this royal giveaway. I play princess with my grand girls all the time. The fabric is perfect. What gorgeous fabric! My best friend's daughter would LOVE anything made by me from this fabric. Maybe I'd make a wall hanging for her pink and purple room! My two year old daughter is starting to catch the princess bug. She asked me if she could have a wand and a crown and told me, "I a pwincess mommy"... obviously, she would love this fabric! Fairy Godmother, please send me some princess fat quarters! That's so sweet! I have my fingers crossed! these are such cute fabrics without being overly girly. I love the sketchy quality. I'm sure my little princess would love for these fabrics to show up at our house. I want to order my servants around. Sigh. Thanks so much for the chance! I'd love some princess fabric for my future little princess granddaughter. I have 4 boys, but my dear daughter-in-law is my family's "princess". I would love to make her a quilt from this fabric. Would be great do a lapp quilt with this lovely fabrics to my little one.Thanks you for the chance! Oh wow! I have a few young nieces that most likely would love this! I would love some of this lovely princess fabric. I would also love to have a spring break! Super cute! Thanks for the chance! Doesn't every little girl want to grow up to be a princess. Cute fabrics. 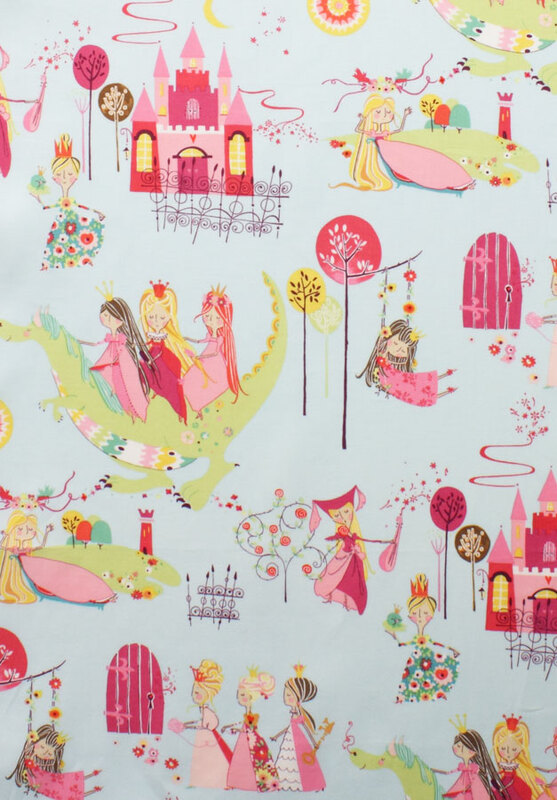 I know my princess would love this fabric. Being the youngest with 3 older brothers it's sometimes hard to be girly! What a pretty line of fabrics! They remind me of Heather Ross a bit. I like how they are whimsical and not cartoony. Love them! My 4yo and 7yo love dressing up in their princess costumes. With looking at quilts in my reader, my 4yo princess keeps adding to the list of quilts that I "have to" make for her. It's cute most of the time. 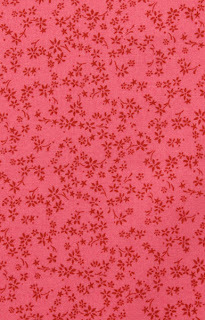 Love, love this fabric! 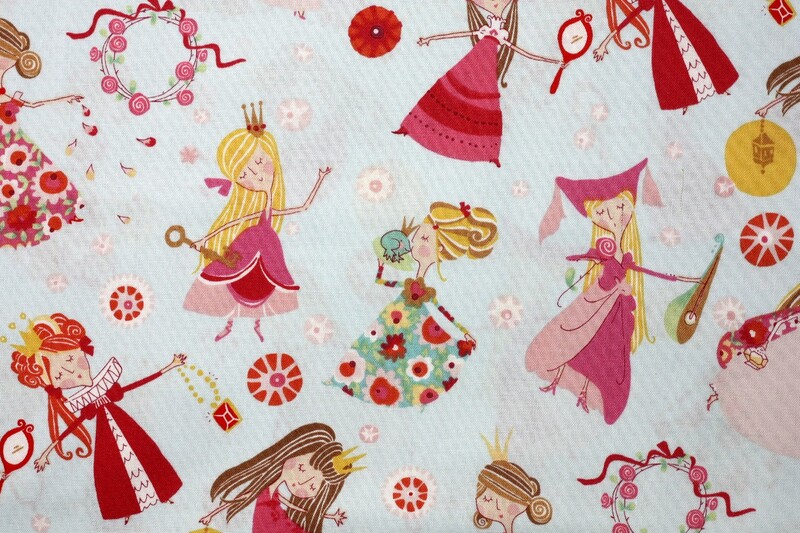 Princess Ellarina-Ballerina would love to have a dress made from this princess-ariffic fabric! I love LOVE this fabric line. Every girl loves being a princess!! The fabric line is great. If only I could find a commoner to cut and sew it for me. This fabric is too sweet! My princess would look magnificent with a quilt made of this fabric, riding in her wagon...I mean carriage at the Texas Renfest this November! I need to start making her costume! This will be her first time going and I'm honestly thinking about making a harness for our Labradoodle to pull the princess around! lol Thanks for the giveaway! As a princess I could command to win, but instead will only request to win, and enter this giveaway fairly...LOL! Princess Buttercup: Farm boy, fetch me that pitcher. Our little princess is our granddaughter, and a Princess Quilt would be a comfort when she at Daddy's house. My daughter is my princess even though she is all grown up. I raised 3 boys and now have a little princess granddaughter that I'm loving to use all these adorable fabrics on! I have five princes and one princess. I would love to make something for her with this fabric. The Princess Bride is one of my favorite movies! Once upon a time, there was a girl who thought she would grow up to be a princess. She didn't. But that didn't stop her from pretending every once and a while, LOL! I have three little princesses - complete with tiaras and a toybox full of dresses. Como rainha da casa tenho tres princesas e uma neta pricesinha de 11 meses.Acho que queria ser fada-madrinha para ganhar estes. HI! I HAVE TWO FANCY-DRESS-UP PRINCESSES IN MY LIFE! Both of my daughter's act like princesses! What terrific fabric! I miss the days where my girls (now teenagers) used to dress like princesses. 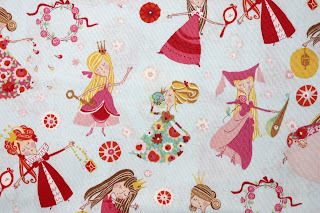 I now have two princesses to sew for and they would love something made with these fabrics. Enjoy your spring break. My girls love princesses. I really should convince my husband to let me buy some of this fabric. My daughter loves princesses and wears a princess nightgown all the time. Oh I have a princess comment. My little princess, granddaughter told me after I made her a really cool princess quilt that she was done with princesses. How do you like that. So I told her okay I will give the quilt to another princess I had in mind!!! Oy Vey!! Kids!! I have another little one who loves princess stuff. My little grand daughter is such a princess and when she comes to visit this summer I'm sure she would love to have me help her make something with the lovely fabric. Thanks. 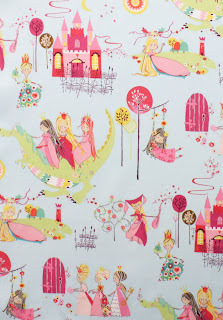 I have 3 princess granddaughters who would love something made with this fabric! Thank you. "Wait, wait. Allow me to let down my hair. Oh dear, it's not long enough! Well, just make sure I have my sewing machine, rotary cutter and mat, and some lovely fabric up here. Actually, let's just make this tower my studio. By the time my hiar is long enough, I MAY have all my sewing/quilting done!!" OH!! I need it!! I'm mom of a boy. 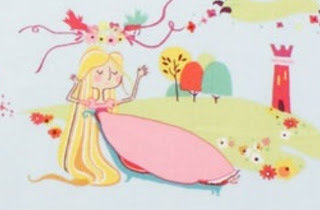 I need some princess themed stuff in my life! Oh, my little lady would LOVE a little more princess in her world! 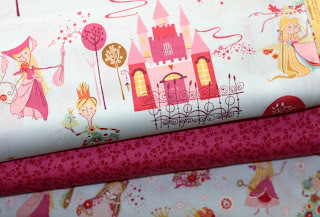 Love these Princess fabrics! Thanks for the great giveaway! Ariel is my all time favorite Princess....although the Once Upon a Time version of Snow White is pretty great, too! In another life I'd love to be Belle! :-) Thanks for the opportunity! oh my gosh, my three little girls pretty much live, breathe and play princess constantly... these would be treasured here. Ahhh swoon! Such cute fabric. My princesses would love something stiched from this collection. Cute little girl purses, a new baby doll blanket, maybe a banner for their room. Thanks for the chance to win! Simply adorable!!!! Thanks for the chance, it would be perfect for a little girl I know!!!! The fabric is adorable! I'd love the chance to win some. Thanks for the wonderful giveaway!. Such cute fabric! 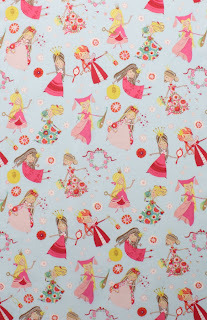 My girly girl of a daughter would love something made with this fabric. Adorable - my favorite comment attributed to Cinderella: "Live like there is no midnight!" MY little Princess would love this, so many possibilities and her favorite color is PINK. My daughter's name is Sarah, which means Princess in Hebrew. My niece, princess Victoria, would like a swirly skirt made of fabric from the castle. My GD Chloe is a princess! I would love to make her something from this beautiful fabric. Just got the Princess tattoo "When you Wish Upon a Star" on my right foot today. What could be more appropriate??? Bippity Boppity Boo...hehe..my princess and I are watching Cinderella right now. Oh my! My girls would love love love this print! So cute! There are 2 princesses in my life - my 2 granddaughters! For years, we called our little girl "Princess", in high school, so did some of the boys she dated.........it's not always a compliment! But, I do love the fabric! 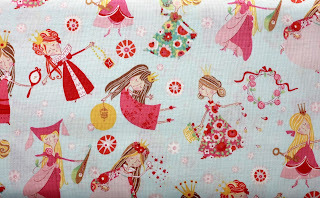 Oh My how sweet is this fabric!!! We added a new Princess to our Family this Monday.... This would make such a sweet little baby girl quilt! I have dusted off my princess crown and put on my lovely princess gown all I need to make the picture complete is to win this bundle. That's tough to think of a princess comment. When I hear the word, I think of the Disney princesses. I have watched those movies over and over again with my granddaughters. My favorite of the Disney princesses would be Tiana. I have a diva in my house and she would love something made from this Princess fat quarter set! Pretty please!! Mirror mirror on the wall what's the fairest fabric of them all? Once upon a time and I hope I win it for my three princesses! Having never had a chance to be a princess, if I won this giveaway, I would buy a Princess crown, make a princess quilt top from the give away fabric, find a soft cuddly backing material for it. I would allow myself a few hours to feel like a princess, wrapped in it's Royalness and then package it up with the crown and give it to a little girls that needs to be a Princess. Such pretty fabric. I could use that for the princesses in my life. I AM the Queen, you know. My Princess is my granddaughter...She really thinks she is a princesses, she loves all the Disney movies that have the Princesses in them. She knows them by heart and would love something made out of this fabric. Thank you for the chance to win some. We have three princesses here, all very beautiful and one is graceful ;). I always wanted to be Buttercup in the Princess Bride. My husband's niece is a princess extraordinaire. Her mother, his tomboy sister, is always amazed that she gave birth to such a girly girl. Thanks for the chance to win.